The strongest- best fitting rack system for cars without factory racks. 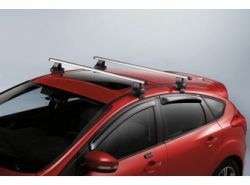 A versatile multipurpose rack system capable of handling any Thule accessory. With bars- feet- fit kit- and locks all included in one box youll be on the road in no time. Why buy from Discount Ford Parts from Sound Ford? Confidence: All of our factory original OEM Ford parts are shipped directly to you by an authorized Ford dealer. Quality: We only sell genuine OEM Ford parts and accessories, the manufacturer's recommended replacement parts that are engineered for your specific model.